The Rubin Museum of Art, a thriving young cultural institution in New York City, welcomes over 200,000 visitors a year and aspires to deepen the understanding and appreciation of Himalayan Art and Culture. As the leading institution dedicated to the region, the Rubin not only researches, publishes and exhibits its collection of over 4,000 artworks, it also creates a stimulating environment. Lectures, discussions, performances, concerts and other programmes support the institution to be an engaging, thought-provoking and inspiring museum with a global impact. This talk introduces the Rubin Museum of Art to the Asian audience. 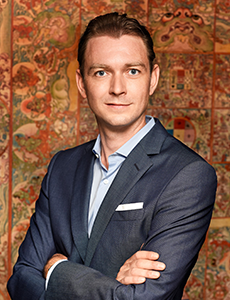 Jorrit Britschg is the Executive Director of the Rubin Museum of Art in New York, dedicated to connecting visitors with the art and ideas of the Himalayan region. He is an historian of Asian art and an experienced museum professional, and strives to expand public awareness and appreciation of Asian art and culture. Previously, he served as Director of Curatorial Affairs at the Rubin Museum, Head of Exhibition at the Museum Rietberg in Zurich and Curator of Indian Painting at the Museum Rietberg. He has organized numerous exhibitions and publications and is managing publisher of Artibus Asiae, a leading journal of Asian Art and Archaeology. He obtained a PhD in East Asian Art from Zurich University and is an alumnus of the Getty Leadership Institute.